Did Nikola Tesla actually work as a swimming instructor? What’s the deal with that famous photo of Albert Einstein and his therapist? Did they actually make radiation-aged bourbon back in the 1960s? Nope! 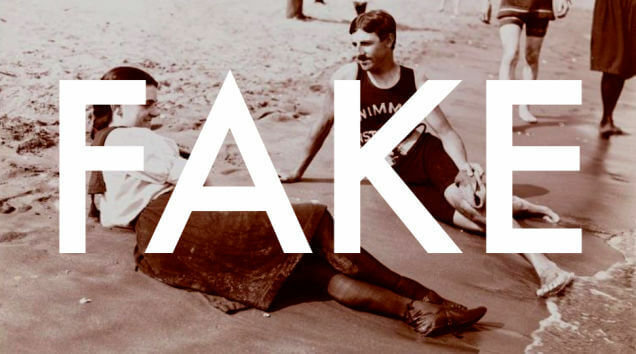 A few weeks ago we looked at nine “fun fact” photos that were totally lying to you. Today, we have seven more images that you may have seen passed around recently that aren’t exactly what they claim to be. 1) Did Nikola Tesla moonlight as a swimming instructor? Nikola Tesla was many things: a pool hustler, a gambling addict, a eugenicist, and a legendary genius. But despite what you may have seen recently in the miscaptioned photo above, Nikola Tesla was never a swimming instructor. The photo is actually from 1898. And while the photo does bear a resemblance to the genius inventor, it’s almost certainly not him. By 1898, Tesla was neck-deep in robotics, radio, and X-ray research. The man was also quite wealthy, enormously famous, and an obsessive tinkerer not known for taking leisurely swims. It seems highly unlikely that he took up a day job as a swimming instructor. But I wouldn’t be surprised one bit if someone was working on a graphic novel with a similar plot at this precise moment. 2) Was this the world’s largest horse? According to the error-riddled history site Retronaut, the photo above shows the largest horse ever recorded — a Belgian Draft called Brooklyn Supreme that lived from 1928 until its death in 1948. “Brookie” was 19.2 hands and 3,200 pounds. But the world’s largest horse ever recorded was actually born in 1848 — a shire by the name of Mammoth (originally named Sampson at birth) that stood at 21.5 hands and weighed a whopping 3,360 pounds. Brookie was a huge horse, no doubt — but definitely not the largest ever recorded. 3) Was this the world’s first ambulance service? The caption often included with this photo claims that the bicycle-ambulance pictured above is the “world’s first ambulance service.” They don’t include a date, but even if we conservatively estimate that this is from World War I, there’s no way that the claim of “first” even comes close. Horse-drawn ambulances were used well before this photo was taken, including as recently as the Civil War. 4) Was this bourbon actually aged by radiation? The label to this “21st-Century bourbon whiskey” from 1960 has been making the rounds lately on countless sites. Americans of the 1960s were certainly obsessed with all things nuclear. But did this bottle really contain whiskey aged 30 days by radiation? Nope. In reality, the bottle was a joke — a novelty sold at stores. The “frisky whiskey” bottle was actually empty, except for a small battery-powered motor that was supposed to spook your party guests with its radioactive wobbling. 5) Is this a real photo of Nikola Tesla in his lab? This image of Nikola Tesla in his lab is kinda sorta real. But much like the Frank Hurley WWI photo we looked at a few weeks ago, this wasn’t a single snapshot. It’s a multiple-exposure photo that makes it look a bit more badass than it truly was. The wizard at his Colorado Springs laboratory sitting among sixty-foot electrical sparks in this illustrious multiple-exposure photograph. One of the stranger claims made by many Tesla boosters of today was that Tesla didn’t know how to properly promote himself, and was thus forgotten by history unjustly. As W. Bernard Carlson explained fantastically in his new biography of Tesla (the best biography of Tesla, if you ask me) the man was a consummate performer who loved to wow audiences with illusions. And this composite photo is a perfect example of his flair for the dramatic. It’s a fantastic photo. But it’s not exactly what many claim it to be. 6) Is this Albert Einstein with his therapist? This photo gets passed around as an uplifting example that even the greatest minds in the world struggle with mental health issues. But does this photo actually show Albert Einstein and his therapist? No. This 1948 photo actually shows Einstein visiting with Cord Meyer, Jr., the president of the United World Federalists, a group that advocated for one world government. According to Life magazine, they were discussing what Russia’s attitude toward world government might be. 7) Were the pyramids actually covered in snow? Egypt did indeed get snow recently. But this picture of the pyramids covered in snow isn’t real. As Snopes notes, an older photo of the pyramids was doctored to create the impression that snow had blanketed the area.